As a high school history teacher in Englewood for the past six years I agree that we must break the status quo. We (parents, teachers, and tax payers of this city) must break the status quo that CPS and our Mayor allow to go on. The status quo of having a mayor control the school system. If as a mayor you have to close any schools you obviously are failing at running the schools. If as a mayor you have to close the most schools in the history of our country you have obviously failed at running the schools. The status quo that allows the Mayor to give lucrative deals to his friends like dodgy head of UNO Charter Schools Juan Rangel who in turn has had millions of dollars of state funding cut off, because he was caught giving tax payer money to his relatives businesses. We have to break the status quo of having the dubious distinction of being the only school district in the entire state with an appointed handpicked NOT elected school board. The mayor not only controls the schools, but then he gets to pick who will be on his school board. The appointed school board is made up of people who do not send their children to public schools and in some cases do not even live in the city. As I teach my students this is called Paternalism. An outsider who claims to know what is best for everyone. Speaking of outsiders and the status quo we also are on our 4th CEO in 5 years. Barbara Byrd-Bennett who replaced Brizard, who replaced Manzany, who replaced Huberman in 2009 is not even from Chicago. In fact she is still registered voter in Ohio. So like the school board someone not from Chicago telling Chicago parents and students what to do. To see Byrd-Bennett’s true policies just look at her brief but damaging time spent in Detroit. The notion that students are trapped in under-resourced schools is partly true. I disagree with the trapped part of the statement but the under-resources part I strongly agree with. CPS and the Mayor say to get more resources for our schools we must close 50 schools. Yet the status quo is allowing some schools to be fully funded using TIF money and other schools like mine and many in the black and brown neighborhoods of this city to not be fully funded. You see with TIFS the neighborhoods with more political clout are allowed to keep their TIF money and have it used for the purposes it was intended such as funding schools. In other neighborhoods the TIF money that is supposed to be used for schools is actually be siphoned from the neighborhoods that really need it and that money is taken downtown for building things like the $100 million River Walk, $300 million to a private university to build DePaul’s new stadium, $55 million for the new Maggie Daley Park. The status quo allows the mayor to take from the poor and give to the rich. The status quo allows school board members like Penny Pritzker to use TIF money to build new hotels while having her bank accounts located in the Bahamas. This means that the status quo allows her to make decisions for schools, take money earmarked for schools, and then not pay taxes that in part should be helping schools. So when the regurgitated rhetoric comes from our CEO, Mayor, or anyone high up in CPS about the Teachers Union wanting to keep kids trapped in the status quo, remember that the Teachers Union is made up and run by 40,000 people who work with students and have committed our professional lives to improving the opportunities for our students. We want our kids to have every opportunity and resource possible. We have a plan for education in this city unlike the Mayor. We demand that instead of closing schools to get the resources our kids should have had all along that the status quo of how the resources are allocated be changed. Since teachers are forced by law unlike the appointed school board and certain higher ups in CPS to live in Chicago these are our children. Barbara Byrd Bennett while talking a good game and using catchy sound bites is really just pretending to care about other people’s children, because like her CEO predecessors she will be gone shortly too. On the night that the largest public school closings in the history of this country were approved by the appointed Board of Education in Chicago I was on CLTV talking about this. Before me on the show was Jesse Ruiz the Vice President of the Board of Ed. It was tough for me to sit about five feet away from him watching him lie on camera while waiting my turn to speak truth. This is the video version of my radio interview this past Saturday morning on the Live From the Heartland Radio Show on 88.7 FM here in Chicago. 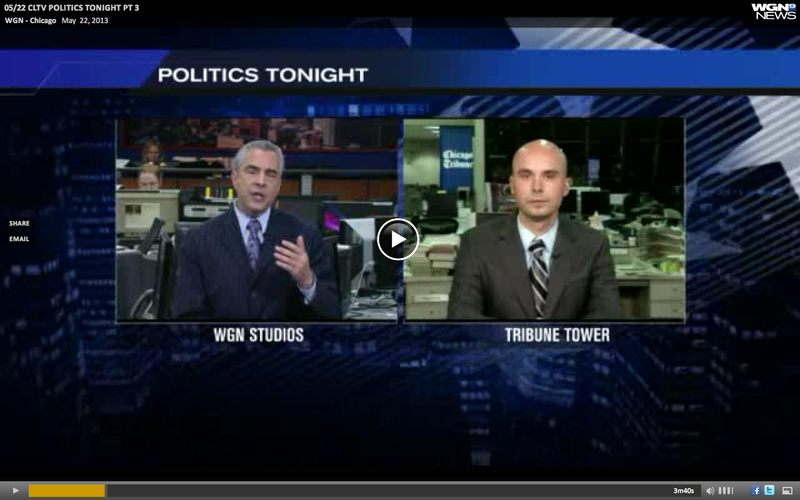 I am talking about school closings, unions, and education in Chicago. The coolest part is that my dad Arny Stieber was on the same show talking about Veterans for Peace and the militarization of Chicago Public Schools his interview starts at 32 mins. Those of us who work with students day in and day out know the brilliance and potential that our students have. We also find ourselves as educators, parents, and tax payers becoming increasingly frustrated by a mayor, “CEO” and appointed school board that consistently and blatantly does not have the best interest of our students at heart. Have no fear our students will lead the way. Yes, our students that the media far too often labels as “gang bangers” “thugs” or “criminals” will lead the way against the harming polices implemented by CPS. Students have been organizing to fight the ill proposed school closings and over testing taking place in our schools. This student led group made up of hundreds of students from various schools across the city goes by the name Chicago Students Organizing to Save Our Schools or CSOSOS. This student led group meets weekly, creates agendas, plans and organizes. These students from various parts of the city cross gang lines, racial lines, to come together to improve this city from the inside out. CSOSOS has organized a walkout/protest of Day 2 of the PSAE testing. Students from other schools have followed in their footsteps and walked out of school to protest the unfair firing of their teachers like what happened at Lincoln Park High School last week. These student groups and student actions aren’t just happening out of thin air, there is a long historical precedent of students leading this city. As a history teacher I decided to do some research and find out as many examples of student actions in Chicago as I could. The following list is not conclusive, but it is a start to give us all the understanding that our students are not only brilliant but are capable of leading this city. The student actions are well rehearsed and organized. Their actions cannot be measured with a multiple choice bubble test. 3.Anti-Immigration Law Walkouts 1995 : City wide student protests against legislation that would take away basic human rights for immigrants. 4.Iraq War Protest Walkout 2003: City wide students walked out of class to protest the U.S. led war in Iraq. 5.Senn High School Student Walkout 2004: Students and community protesting becoming a Military School . 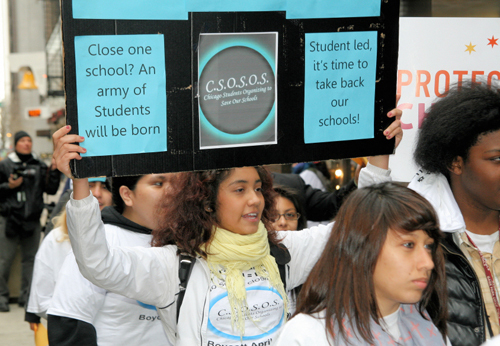 6.School Closing Walkout 2009: City wide walkouts against the proposed school closings. 7.System Wide Proposed Funding Cuts Walkout April 2010: CPS was thinking about cutting extra curricular activities and programs. 11.Day 2 PSAE walkout April 2013: Students walked out on the 2nd day of PSAE testing against school closings and over testing. 12.Lincoln Park High School students walkout May 2013: Students protesting the wrongful firing of many of their teachers. Needless to say our students are intelligent and partake in the democratic process that this country was founded on. So if our students feel forced to have a protest to make their voices heard, join them. They are teaching all of us what Democracy looks like, sounds like, and feels like.